Having young children of my own, and often entertaining groups of friends along with their children, really made this project hit close to home for me. When I met with the homeowners they indicated that the backyard just didn’t flow or offer any unity for family activity and entertaining, so we began working on a landscape design to harmonize their backyard with their goals. Below, I will share some of the elements that made this project a success and very fun to be a part of. The first item to address was the existing deck which had an aging set of steps to the yard, and an overall layout that was very long and narrow making it hard to arrange furniture without disturbing the natural flow and was simply difficult to comfortably entertain friends and family. We redesigned the living portion of the deck by making it much larger and positioning the main living space within a radius. Because there was going to be lots of reasons for children to gather and play in the yard, we wanted the deck view to make it easy to keep an eye on play time. 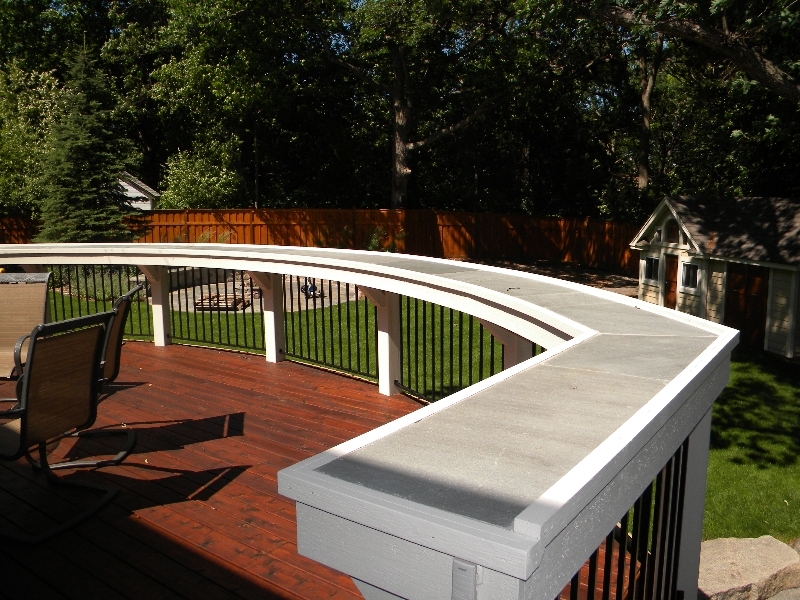 One playful element to help with this was the construction of a custom railing which was built at bar stool height and has an 18 inch deep inlay made of cut Bluestone, allowing comfortable space for a dinner plate or glass of wine with easy visual access to the entire yard. For easier entertaining we built an integrated outdoor kitchen into the end of the deck complete with Kitchen Aide stainless steel appliances, from the built-in grill head to the refrigerator, barbecue parties couldn’t be easier. At the lower level walk out is a large patio made of New York Bluestone which is cut and patterned and is home to plenty of seating area as well as a large spa for relaxing evenings under the stars. One side of the hot tub has a privacy screen built of cedar with a solid stain and a beam Arbor over head for architectural structure and interest. The lower Bluestone patio is separated from the yard above with a fieldstone boulder wall with cut boulder steps for a safe and convenient way to get around. The upper yard is home to a large New York Bluestone firepit Patio with a mortared, split fieldstone seatwall, constructed with a curved radius to match the deck design. Surrounded with upright grasses, spruce trees and flowering perennials, it’s the perfect place to enjoy a fire on a crisp spring or fall evening. Also found in the upper yard, opposite from the fire pit is an Interlock LaMont paver walkway from the deck landings to the fence gate, winding visitors through gardens of various ornamental shrubs and perennials, for the easy flow from front to back a busy family needs. To pick up on the other patios, the walkway has random pieces of Bluestone inlays within the pavers. Overall, the backyard now has multiple features for kid friendly fun and plenty of spots for entertaining friends and family.